Plantain is native to Europe but is widely naturalized around the world. It is best known for its remarkable ability to draw foreign substances out of the body. In particular, venom from a snake bite, spider bite, mosquito bite or bee sting. It can draw out and close up pus and infection from dirty wounds and soothes irritated membranes. 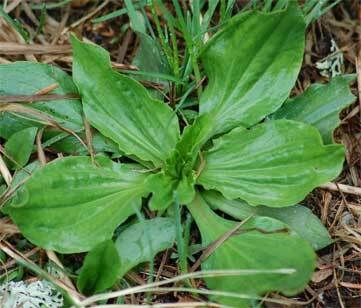 Plantain is also helpful in bronchial infections and pneumonia. It cools and moistens the mucosa but also dries up mucus and water from the lungs. It is mucilagenous and aids with irritation in the trachea and bronchi with an irritated cough. For drawing out toxins from a bite or sting, chew up the fresh leaf and place on the afflicted area. Juice the leaves fresh during summer or dry them for winter use. For tea, make a cup to drink 1-3 times a day, daily or tincture fresh in alcohol. When you don’t have fresh plantain handy, this ointment will help with drawing out toxins from the body. Fill a jar with chopped fresh plantain. Cover with olive oil and allow to steep for 6 weeks covered. Strain. Warm the infused oil and added grated beeswax to the pot. The more beeswax, the harder the salve will be. To test for consistency, take a spoonful out and place on the counter for a few minutes. You can adjust by adding more oil or beeswax. Pour the mixture into jars and allow to harden. For more information on plantain check out these two materia medicas from Herbal Remedies Advice and Our Herb Farm. Cautions/Contraindications: Considered safe, may cause dermatitis in a rare few.